For over 24 years, Stellar has successfully restored data from all possible devices and systems. Secure and fast data erasure solutions according to international standards. Stellar has efficient data recovery softwares and caters to over 2 million customers world wide. Do not worry! With Stellar’s MacLab Data Recovery service, all your data can be recovered. Stellar Data Recovery Mac, with its team of Data Recovery and Mac experts, specializing in Apple and the necessary infrastructure with Class 100 clean rooms, can recover any lost or inaccessible data from your corrupted Mac system. Although Mac systems are known as robust computers, many users have experienced a loss of data due to a system failure. In addition to the many facets of data loss, the failure of a hard drive or other storage medium is the most critical. In such situations, all data from the Mac is no longer accessible because of the faulty mechanism, electronics or the firmware. In the Stellar MacLab you always have the best chances to recover your data. Stellar, with its latest hard disk rescue and specialized tools, can save valuable data from almost any type of corrupted media, including mechanical components, burns, firmware failure, etc. Stellar’s innovative disaster recovery is also the key Able to save data from any Mac system that was damaged by natural forces (fire, flooding, electricity, earthquakes, etc.). Note: Stellar rescues data from all Macs, from the first to the most recent system, regardless of manufacturer, model, operating system, or type of files, from both Intel and PowerPC-based Macs. 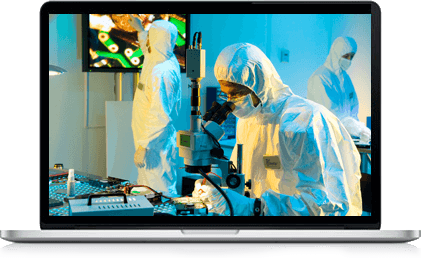 At Stellar, all data recovery from damaged Macs is performed in a Class 100 clean room. A class 100 clean room is a strictly controlled environment in which less than 100 dust particles are located in a cubic foot of air less than 0.5 micrometers. Dust particles, which are larger, can get stuck between the plate and the reading head, resulting in scratches and irreparable damage. Upon arrival, experts from Stellar MacLab will first examine the Mac’s media in a Class 100 clean room. The details are communicated to the customer together with a non-obligatory cost estimate for the diagnosis. If the offer is accepted, the rescue operation begins. The rescued data is passed in a similar type of storage medium. Through the transparency and confidentiality of the entire data recovery process, Stellar ensures the security of the data despite a short processing time.